Not to toot my own horn, but I kinda know a lot about acai bowls. Like a lot. Like I worked at an acai bowl shop for over a year type of lot. While working at this acai shop, I learned all about this superfood acai berry and all of its health benefits. Acai is an antioxidant berry that's from South America, Brazil, and Trinidad. Since this berry has a short shelf life, it is shipped around the world in a frozen form to extend its shelf life. That’s why it is a favorite ingredient in acai bowls because it tastes amazing when it is frozen and then blended up. This berry is called a superfood because it is supposed to assist in weight loss, skin appearance, and detoxification. Let’s get to the fun stuff, making the acai bowls. Today, I’m going to share with you two of my favorite recipes, a fruity tropical bowl, and a chocolate peanut butter bowl. I could easily eat these two dishes every day! And they are super easy and quick to make in your dorm room before class! Let’s get started! Combine all of your frozen ingredients and unsweetened vanilla almond milk in a blender. You want to blend the ingredients until it is smooth, but also a thick consistency. If it’s too runny, it will become a smoothie rather than a bowl that you can eat. Take the bowl you are going to eat out of and sprinkle a handful of granola at the bottom of the bowl. Next, pour the fruity, frozen mixture on top of the granola. Now it’s time for the fun part, decorating the top of the bowl! Making the toppings look cute is crucial to making it Instagram worthy. I like to add two handfuls of granola on top, sprinkle the coconut shavings, and then slice the strawberries and decorated the bowl with them. My favorite topping, however, is agave! It’s a sweeter version of honey, and I add it to all of my acai bowls! Same rules apply for this bowl. Combine all of your frozen and liquid ingredients and blend up! Add a handful of granola to the bottom of the bowl, and then add the frozen mixture. For the toppings, I add two handfuls of granola, sliced banana, cacao nibs, and agave or honey. Of course, feel free to add or subtract ingredients or toppings to either of these recipes, these are just two simple recipes that I enjoy. Often I’ll add different fruit to the top of my bowl depending on what is in season and in my fridge. I love adding frozen mango or frozen peaches to the fruity bowl, and sometimes I’ll add chia seeds on top of the bowls. 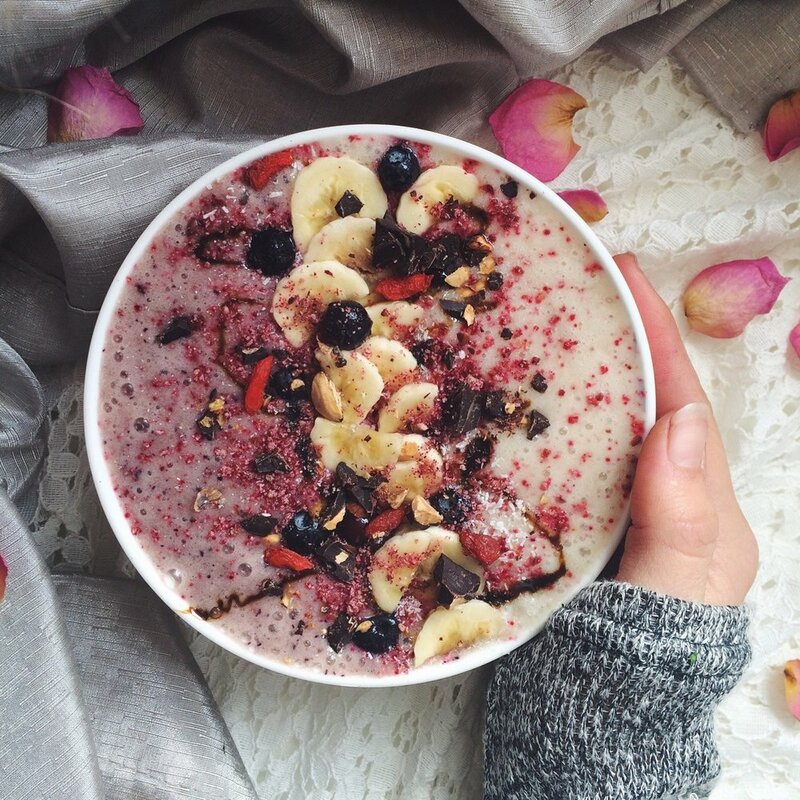 I hope you enjoyed this post and let me know if you tried either of these acai bowls out! Everything You Need to Pack for College!